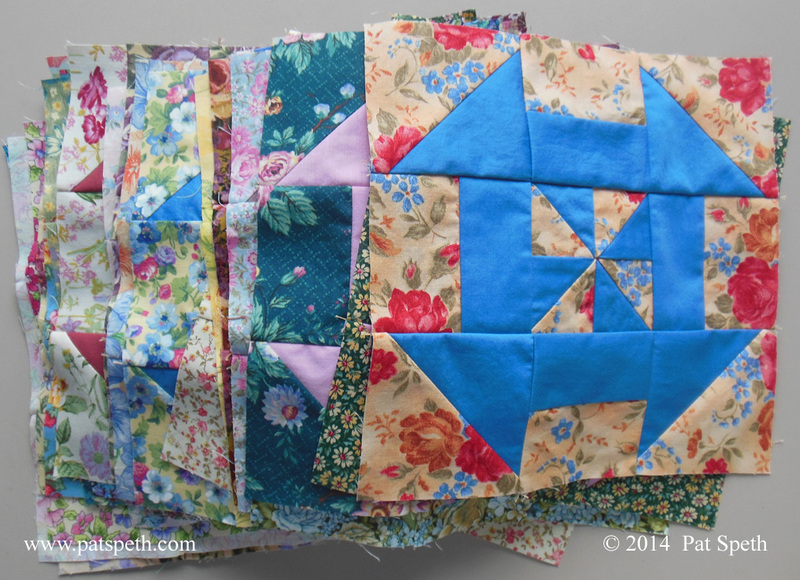 Quilt retreats are tons of fun and Nickel Quilts are a perfect project to work on at retreats, whether they are in a group workshop or as an individual project. 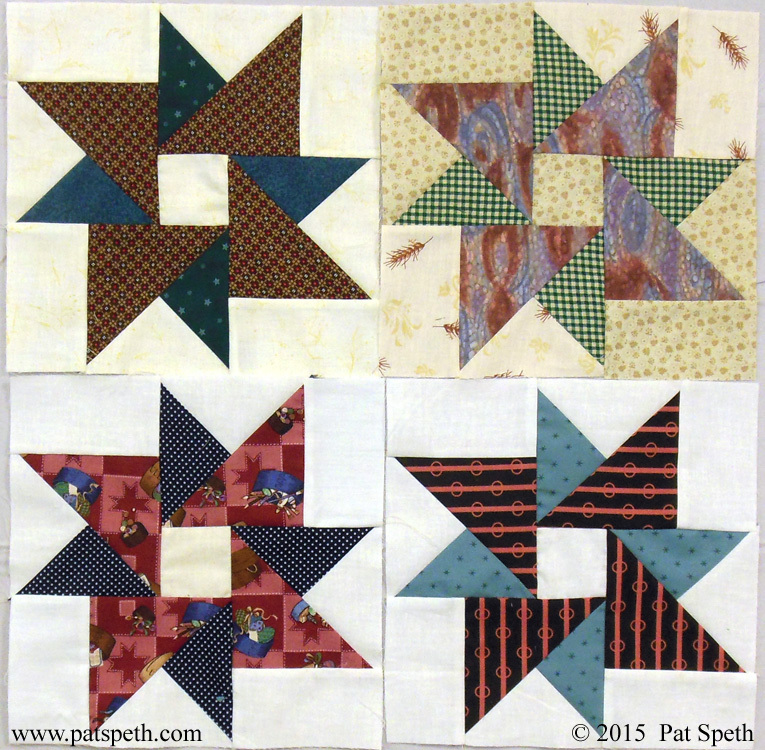 The Heartland Quilters Guild in Columbia, Illinois choose my Combination Unit workshop in which seven different quilts can be worked on, all in the same workshop. 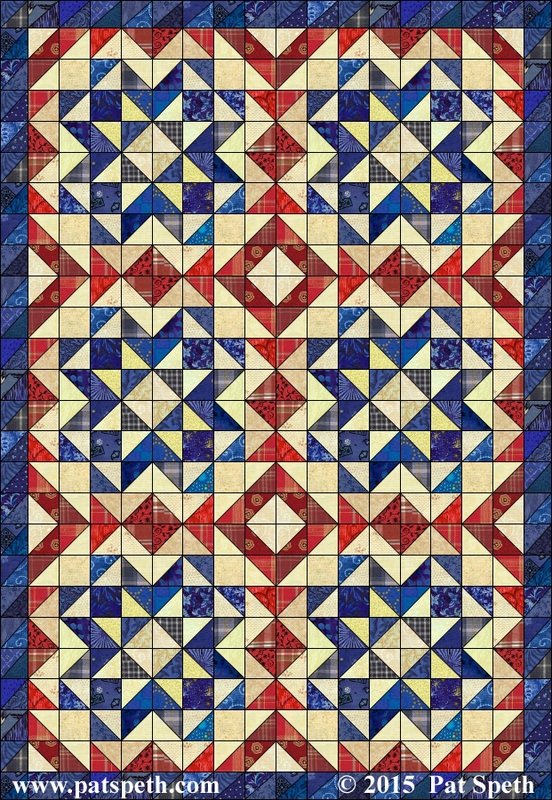 The quilt chosen by the most participants was Labor Day Stars; it is an individual pattern and can be purchased on my website. 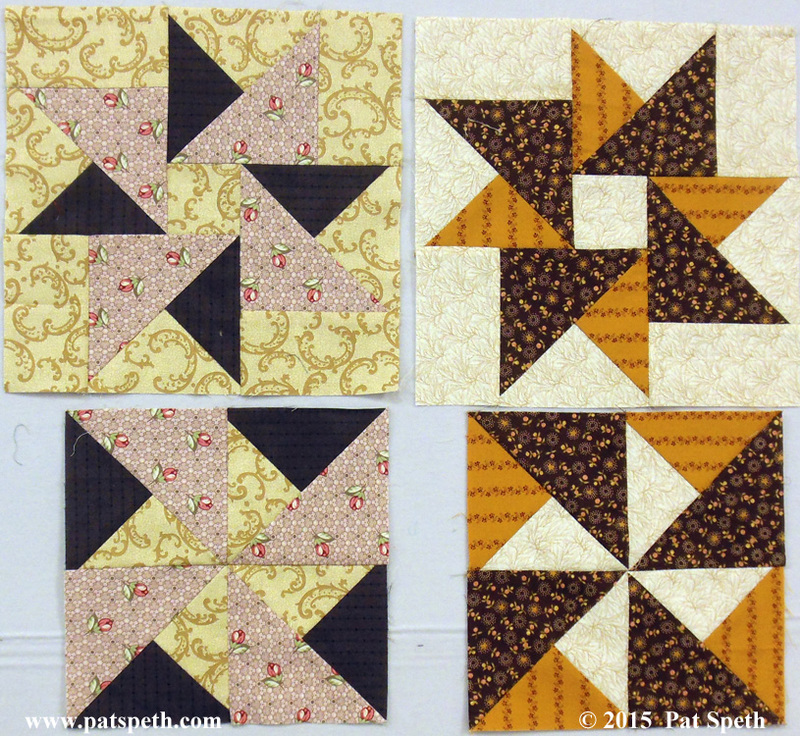 When making the Combination unit my way we end up with mirror image units and the Labor Day Stars quilt uses both of these units in the same quilt. We create stars spinning in two different directions. 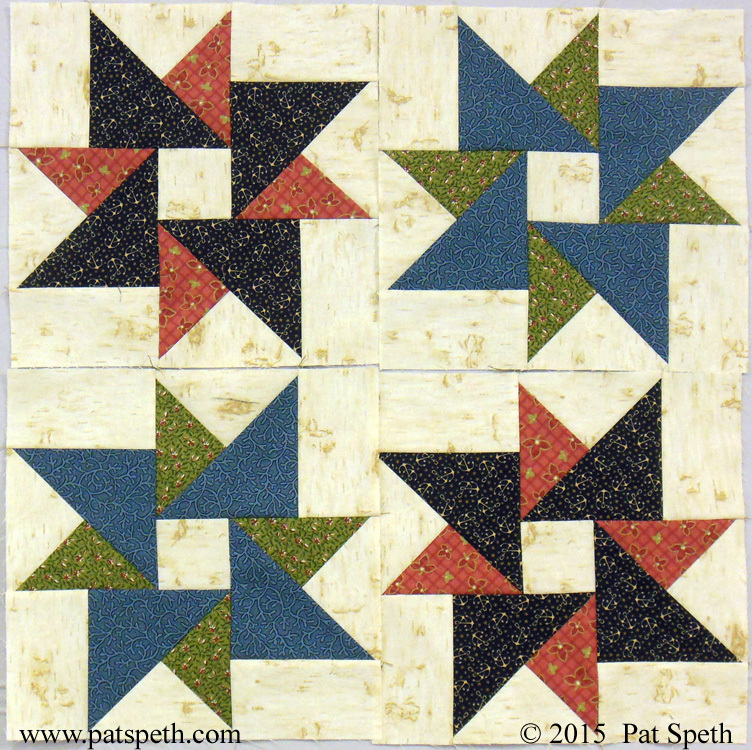 When the quilt is assembled there will be sashing between the blocks to help camouflage the fact that the star points sometimes would line up perfectly and other times would be off by about an inch and a half! 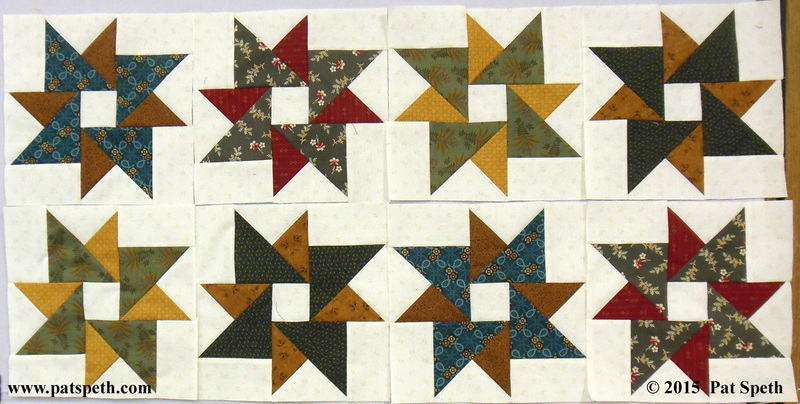 Here are blocks by three different workshop participants, do you see the left spinning and right spinning stars? 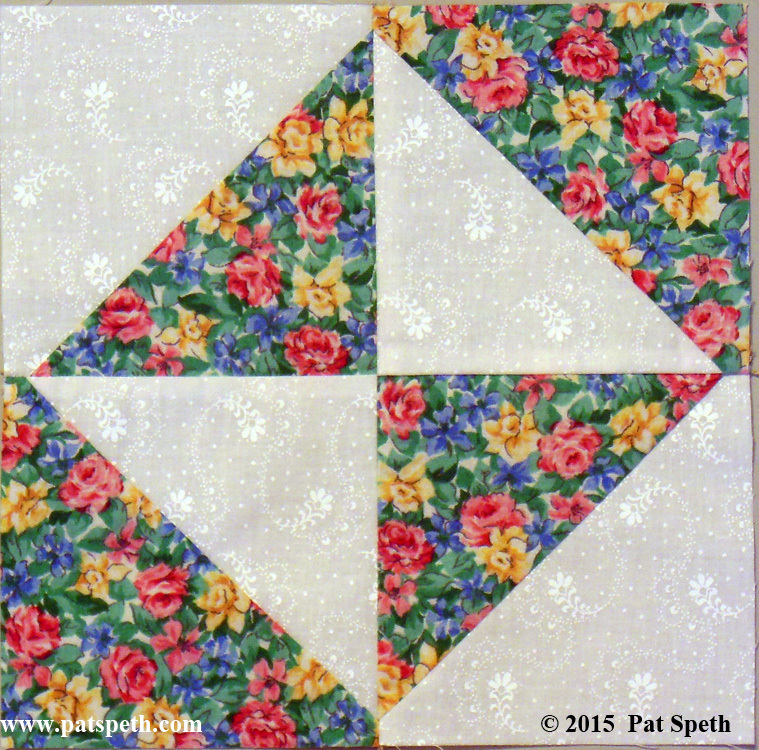 This quilter decided on a little bit scrapper look. 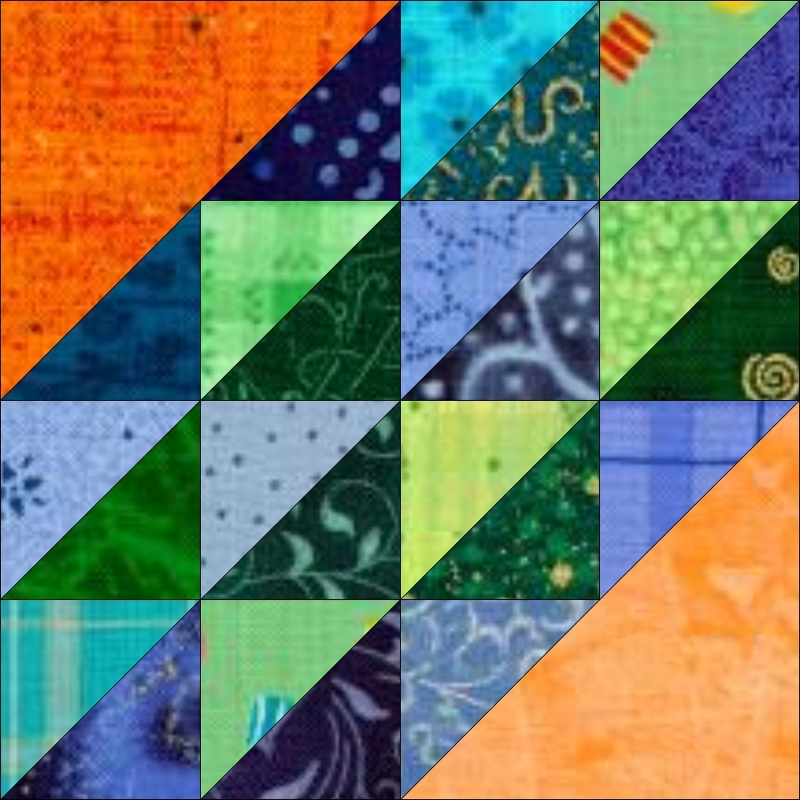 That’s one of the things that I love about my designs, they can be controlled with fewer fabrics for those who don’t like scrap quilts or are just not comfortable going really scrappy or they can be super scrappy! 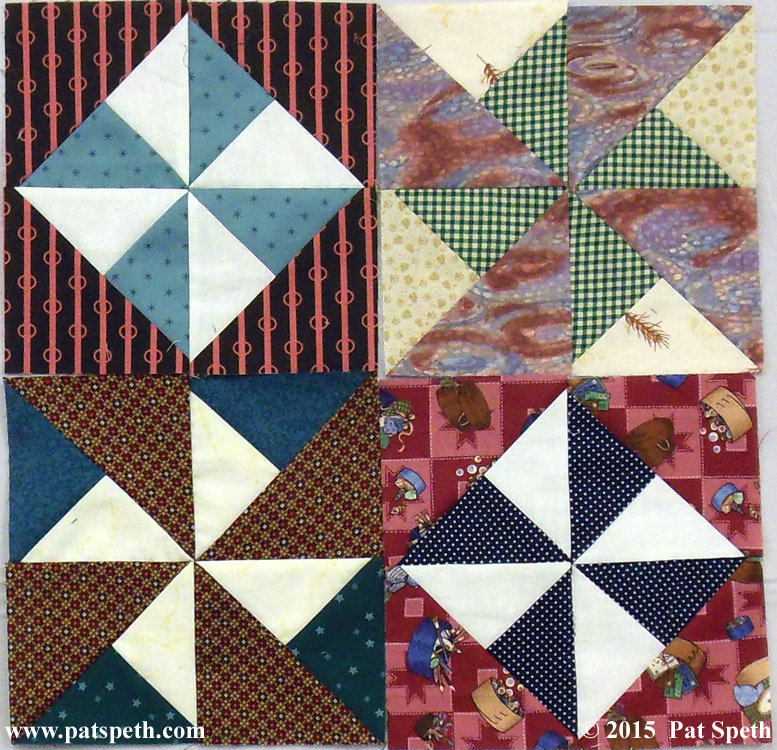 A few others in the class chose Labor Day Madness and the Pinwheel quilt to make. 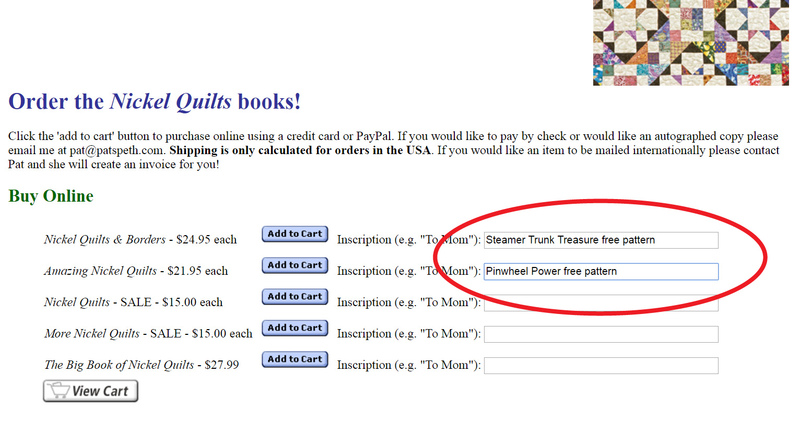 Instructions for these quilts can be found in Nickel Quilts or The Big Book of Nickel Quilts. 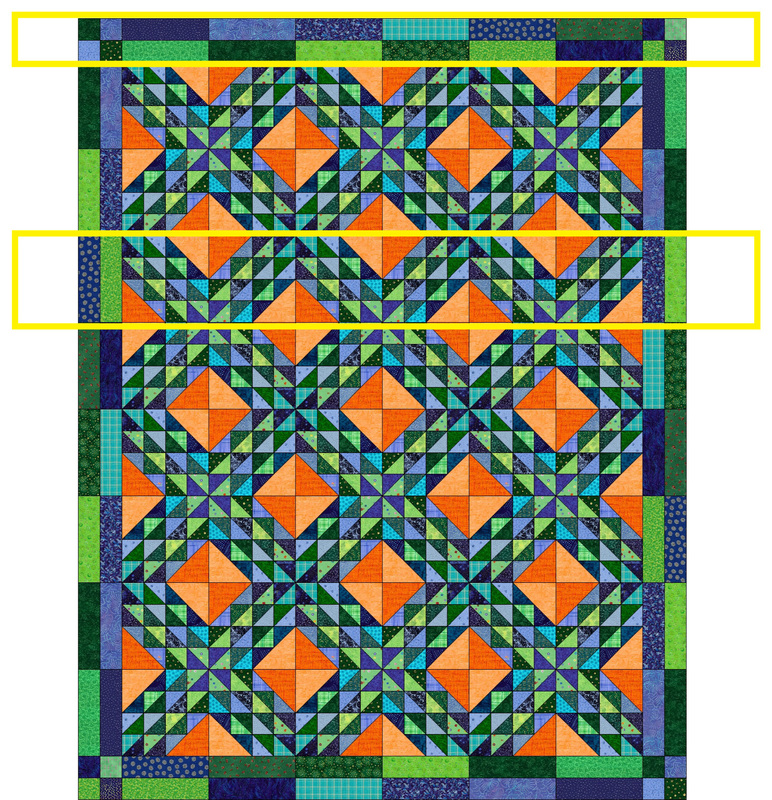 With these two quilts we use one of the mirror image units in the Labor Day Madness quilt and the other unit in the Pinwheel quilt. 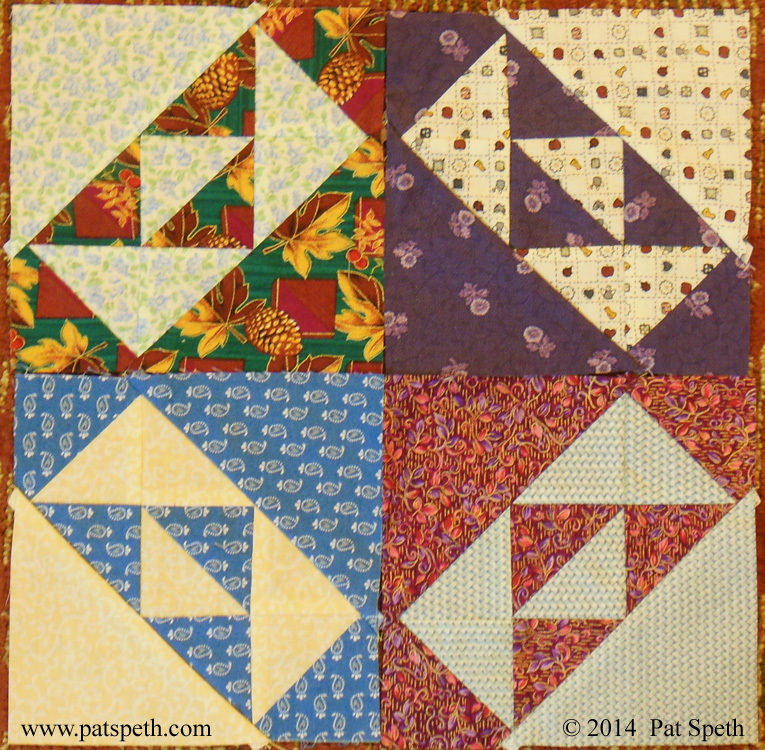 Here are four Labor Day Madness blocks and four pinwheel blocks. 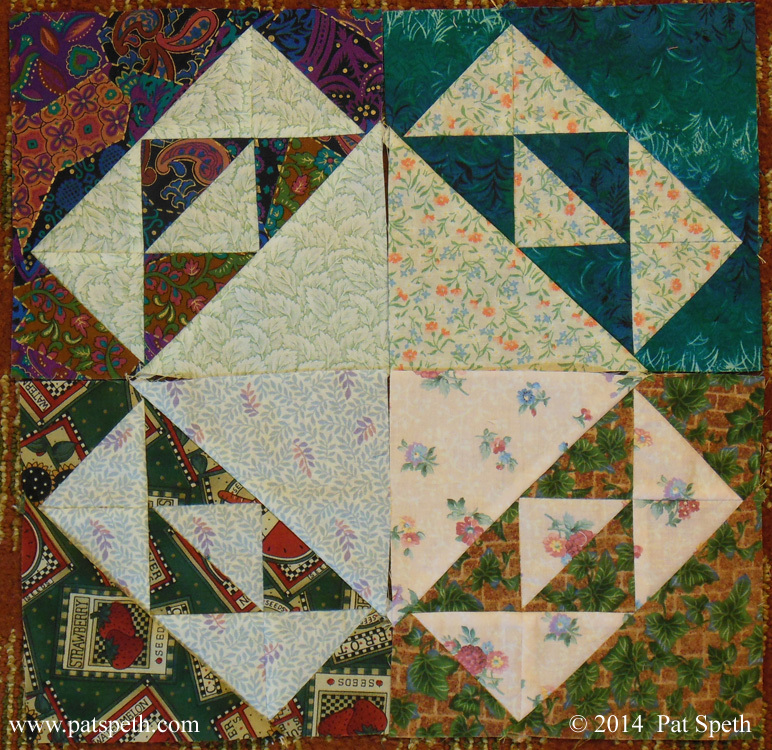 Notice that this quilter used three different pinwheel variations. 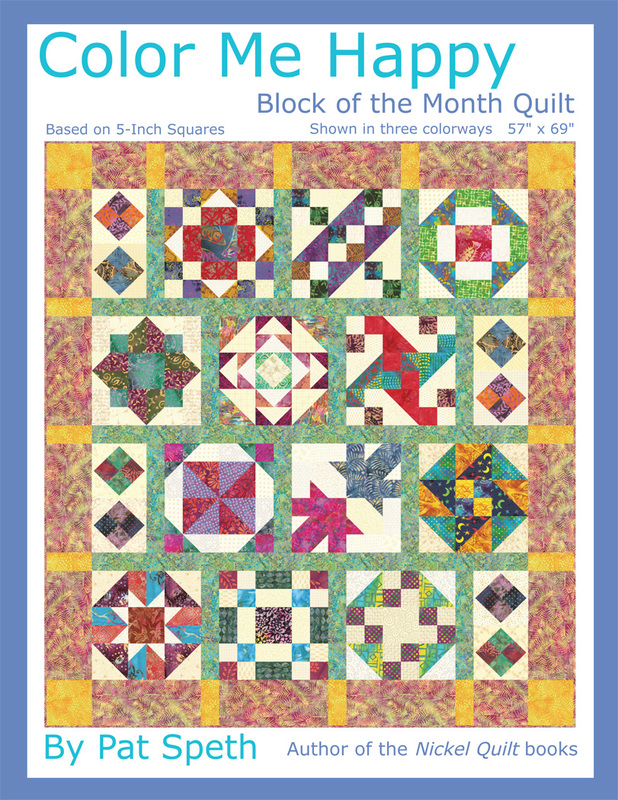 Here are two more sets of the Labor Day Madness block and it’s bonus pinwheel blocks. 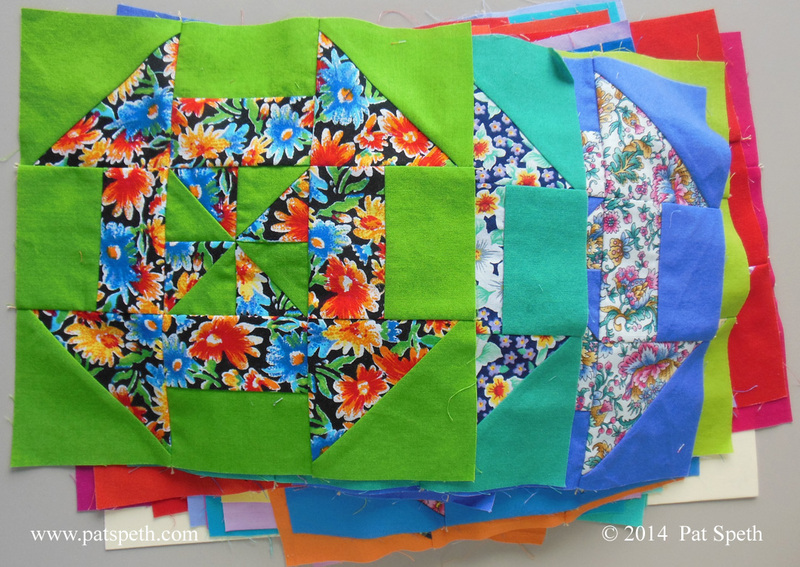 Another wonderful workshop and another group of quilters having fun working with 5″ squares! 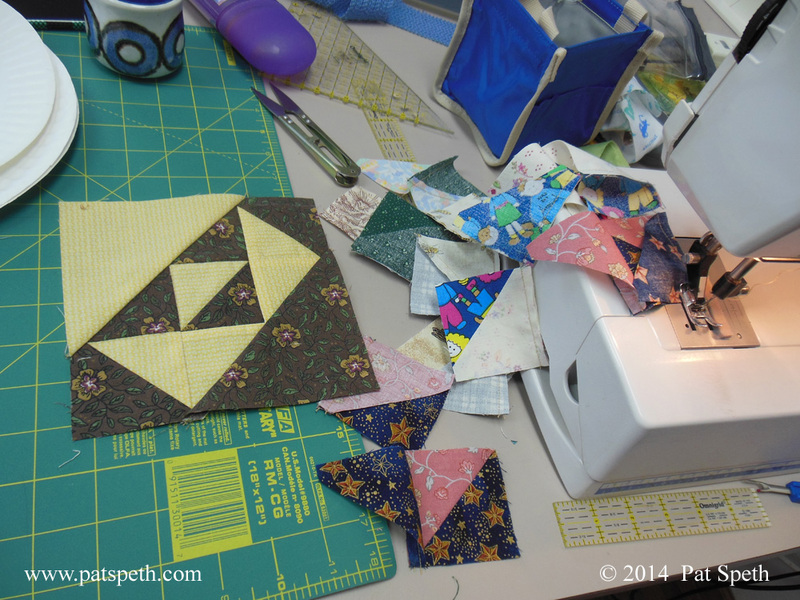 I am retreating all this week with quilting friends in New Glarus, Wisconsin! I got up early yesterday (around 4:30am), loaded the van, shoveled snow for an hour before heading out of town. 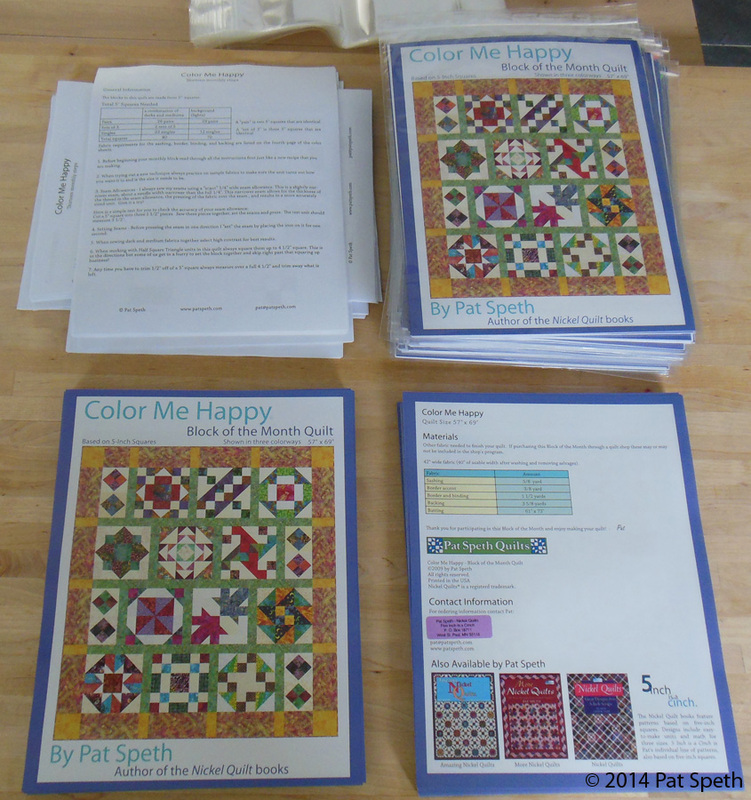 We arrived yesterday afternoon and have settled in for some quilting, catching up on what everyone’s been up to, and just having a great time. 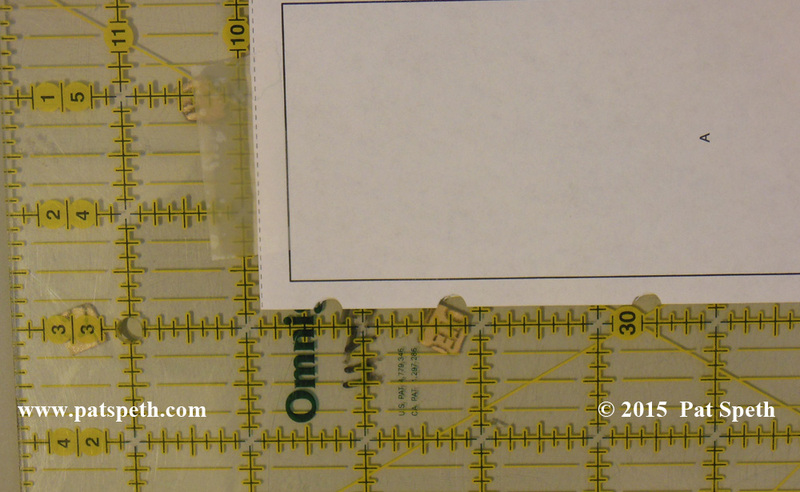 I brought several projects along to work on; one is the UFO I took to work on during a couple of teaching trips. 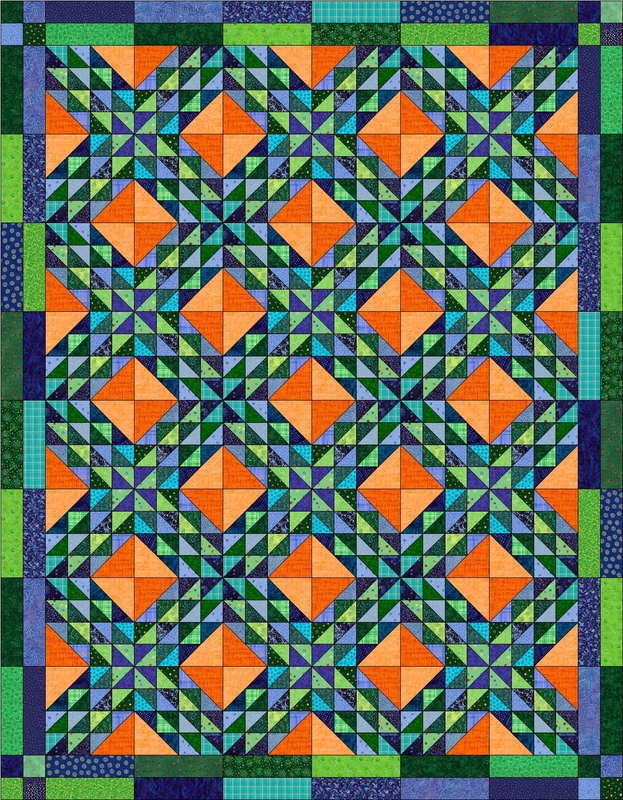 It’s still not done but I do enjoy making these blocks, which is a good thing because the design I’ve decided on needs 140 blocks! 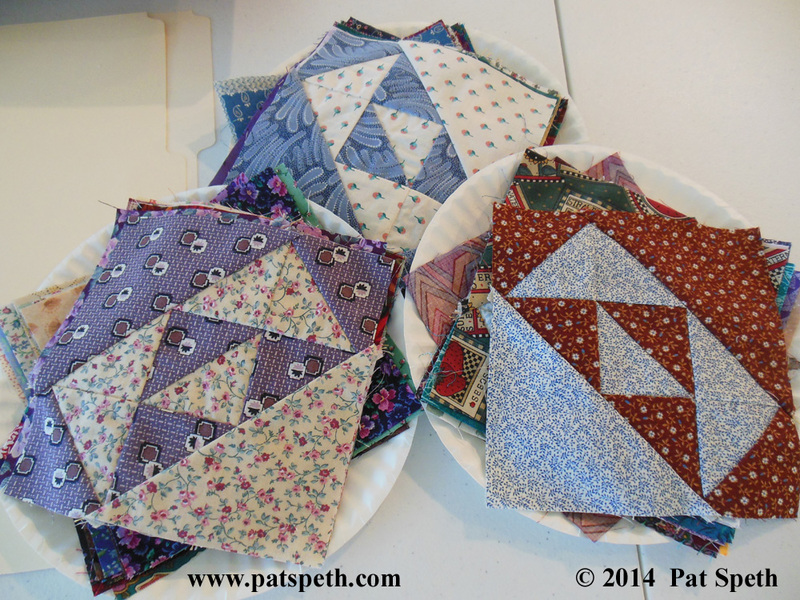 I have two different sets of churn dash blocks with me that are ready to be set together into quilt tops. 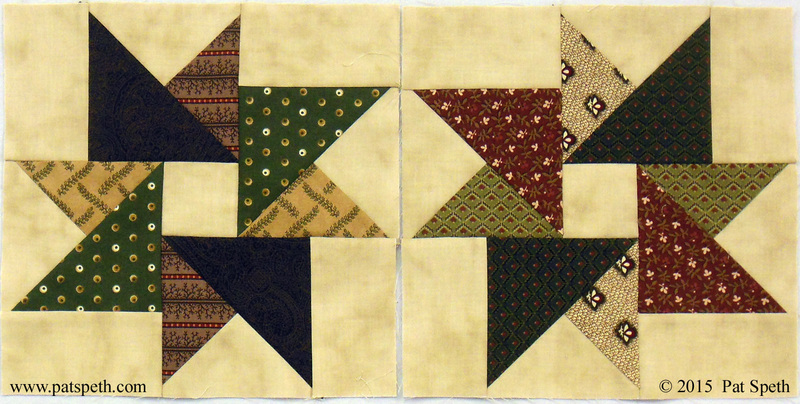 They are just positive and negative versions of the same block. 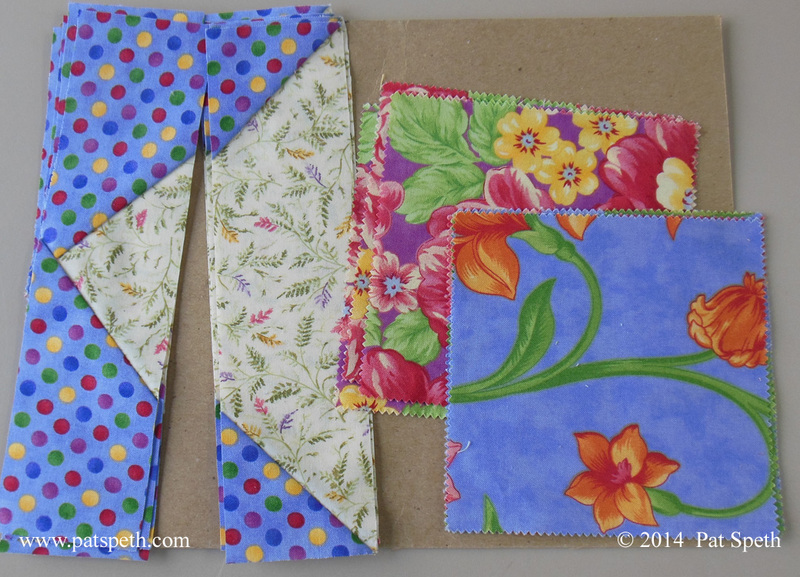 I liked both versions and since I have no shortage of fabric in my life and I love to piece blocks I’m making both! 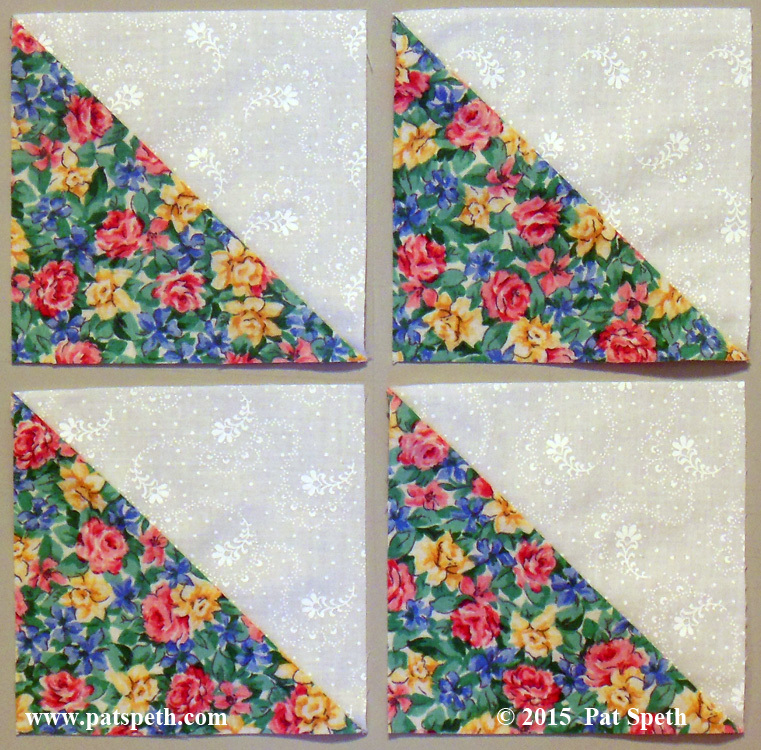 Playing with a tub of 6″ floral squares I’ve combined them with solids. 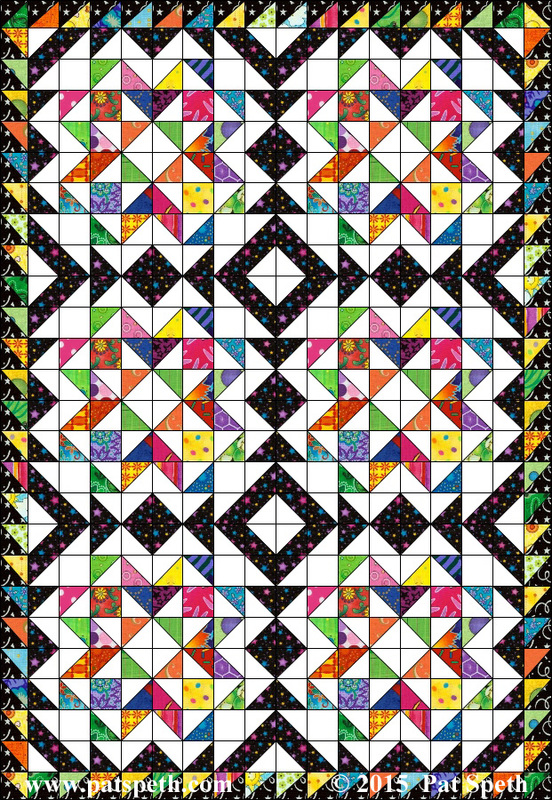 This version has the solids making the churn dash in the center. 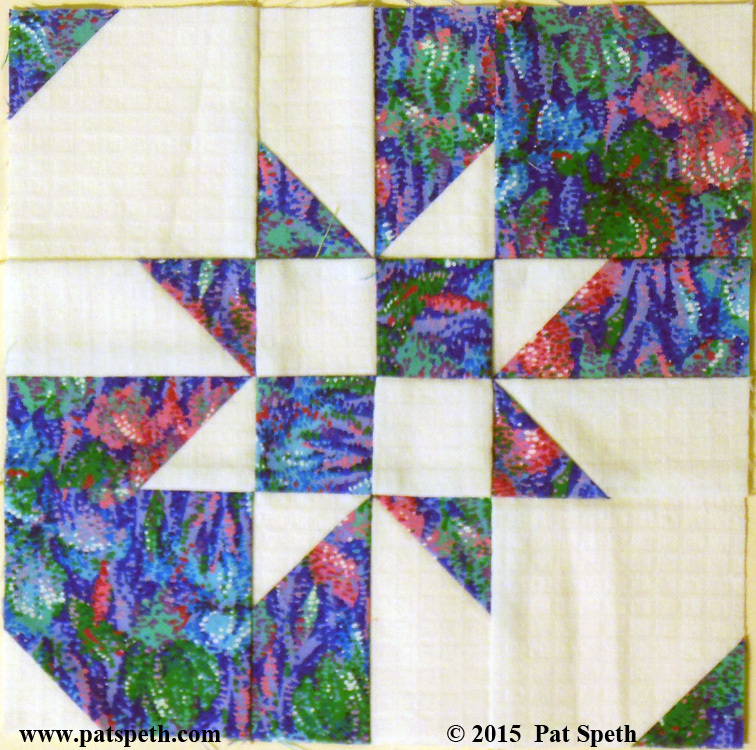 And this version has the florals creating the churn dash. 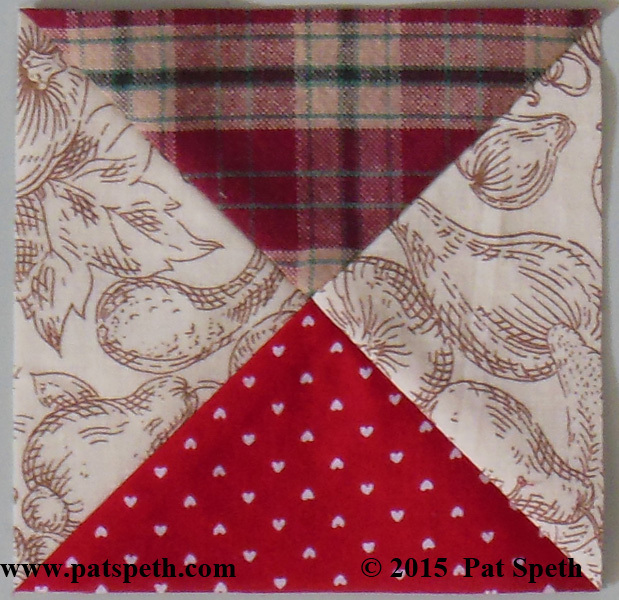 I’ll also make the next pair of Deli Geese blocks. 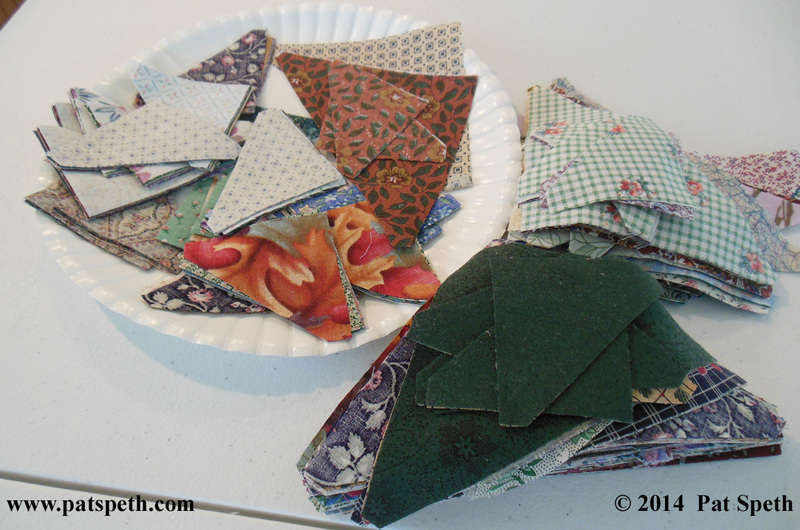 I have a few more projects with me, one can never bring too many to a week long retreat and sometimes I get tired of a project and want to work on something else for awhile. Hope your week will be as great as mine! A Twenty Year Old UFO! 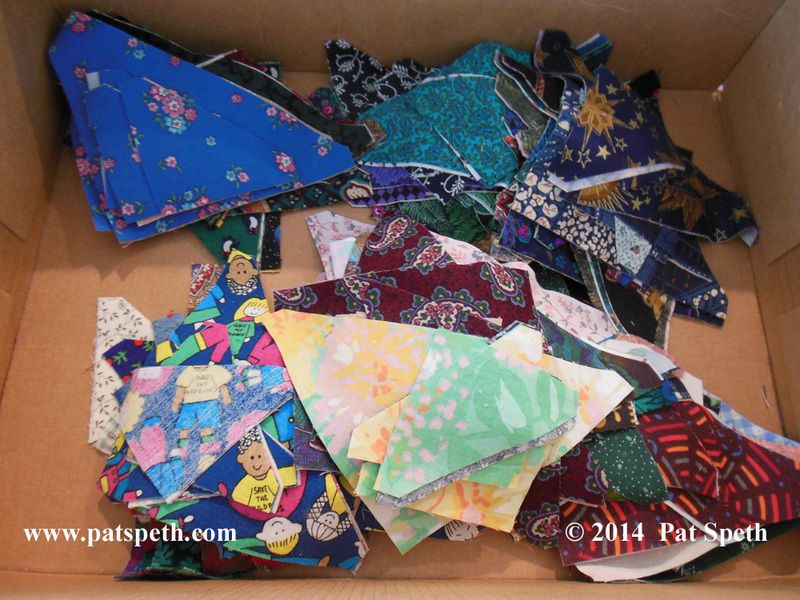 I have some down time on this road trip so I planned ahead and brought some projects to work on. I dug out a UFO that has to be around twenty years old! 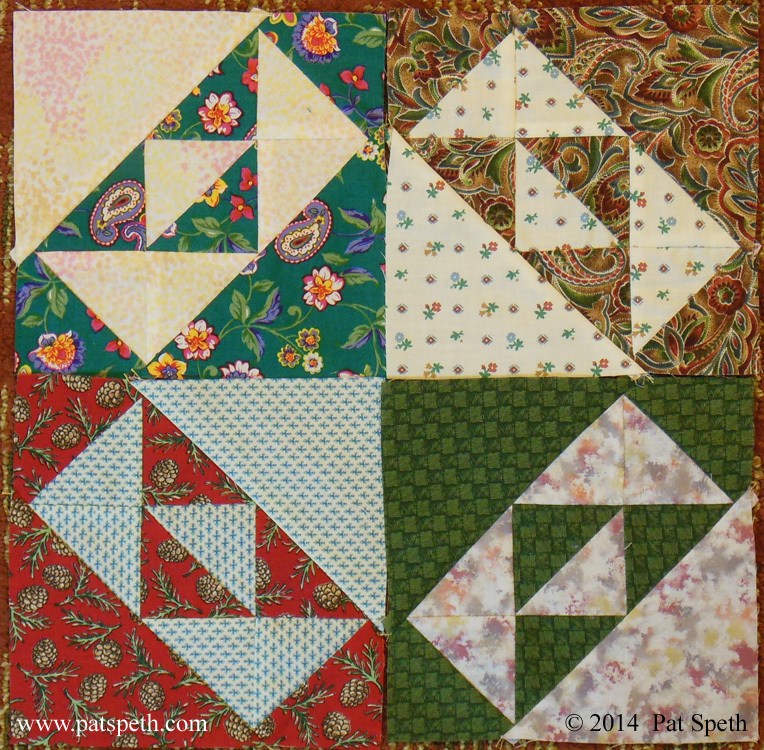 The blocks are 6″ and a variation on the traditional Northwind block. 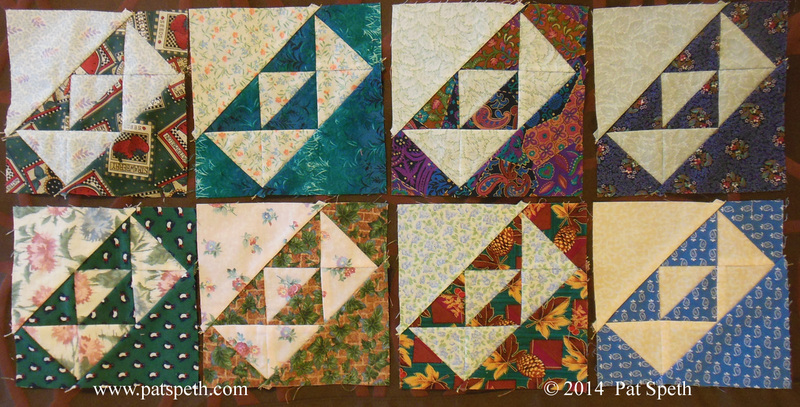 These are some arrangements I’m considering; grouping them into sets of four that would then finish 12″. 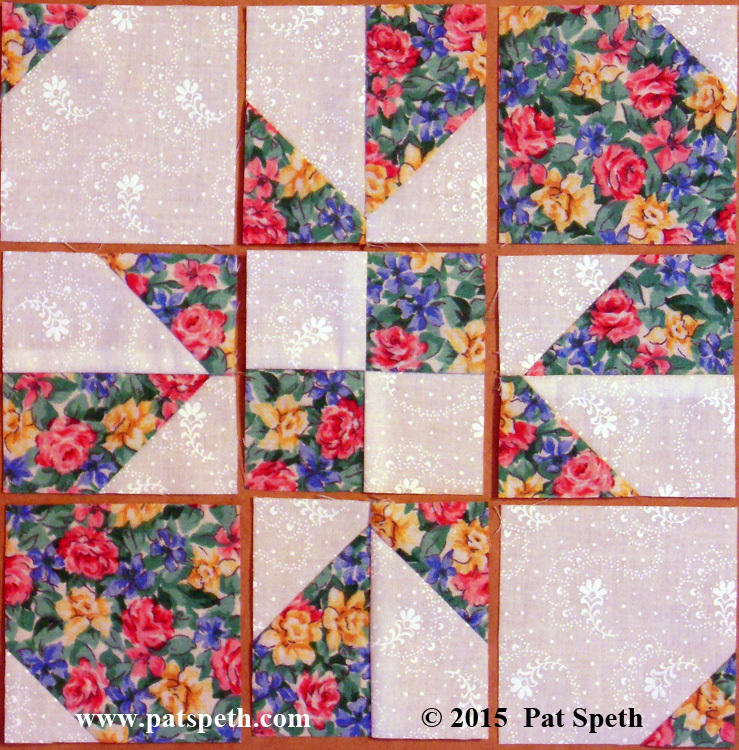 So far I have 52 of the blocks done. 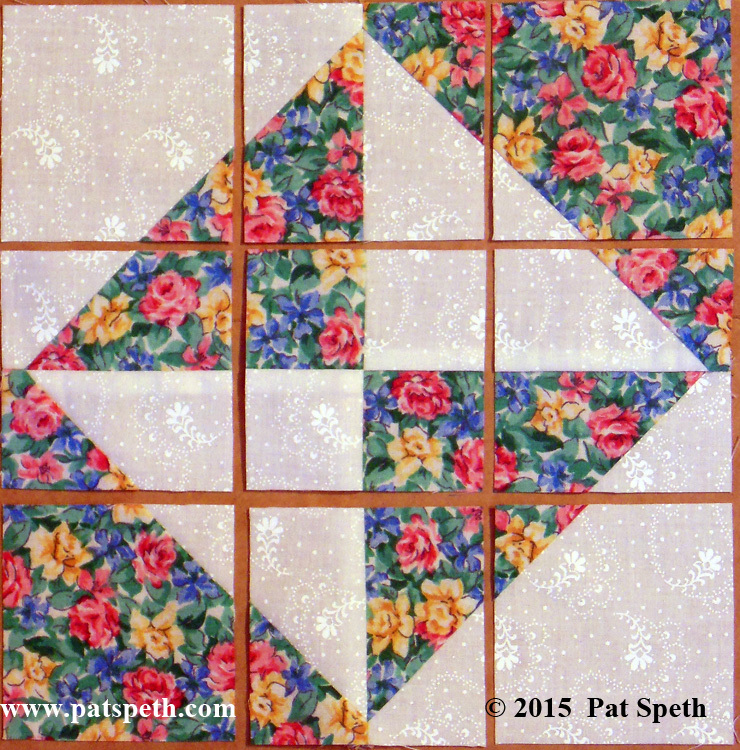 I’m not sure what my original plan was for these blocks but I think it may have been for a twin size quilt. I have some nice stacks of parts all coordinated for blocks and then I have some parts that don’t go with anything! This box is about is about a third full of the pre cut parts and I have no clue how many there are. 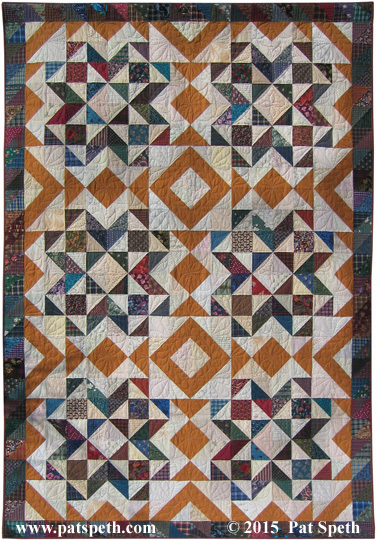 I could take the time to count them, which would appeal to the accountant in me, I could just wing it and make blocks until I run out of parts and design the quilt from what I have, and that would appeal to the artist in me. Whatever I decide to do I will keep you posted with the progress. Anyone else out there inspired to dig out an old UFO and work on it?